Last Sunday dawned bright and breezy and perfectly spring. The Frenchman and I drove an hour from our apartment to the parking lot of a strip mall. We waited. After a time, a jeep wrangler came careening into the lot, and parked beside us. Inside was my favorite market farmer and his wife. We said good morning, and he joked again that it was time to blindfold us and stuff us into the trunk before the next stage of our operation. The joke made me laugh, firstly because he used to be a cop, and also because I think he trusts me more than that; however considering the hysteria around ramps, I could see it being a valid request. 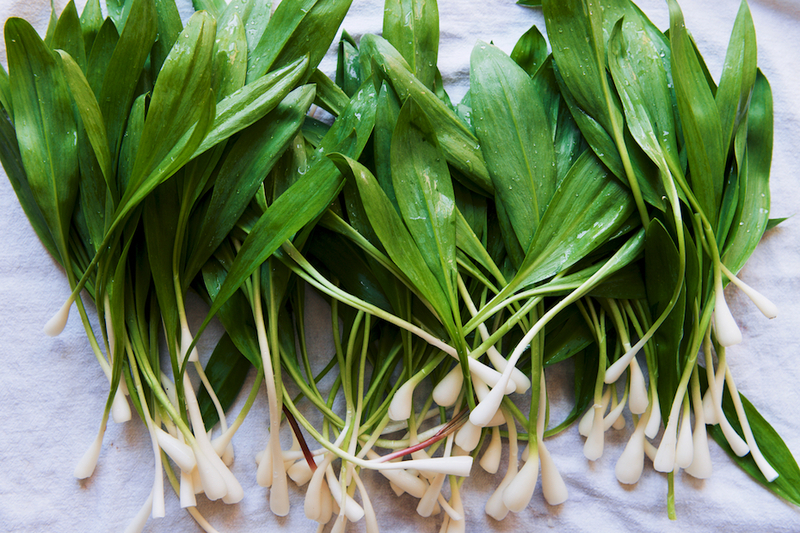 Ramps are wild alliums; they have a light, almost sweet, lemon-garlic flavor. They’re special because their growing season is incredibly short, just a few weeks per year, and because they’re one of the first harbingers of spring. But what makes them especially precious is that they cannot be cultivated; they must be foraged. 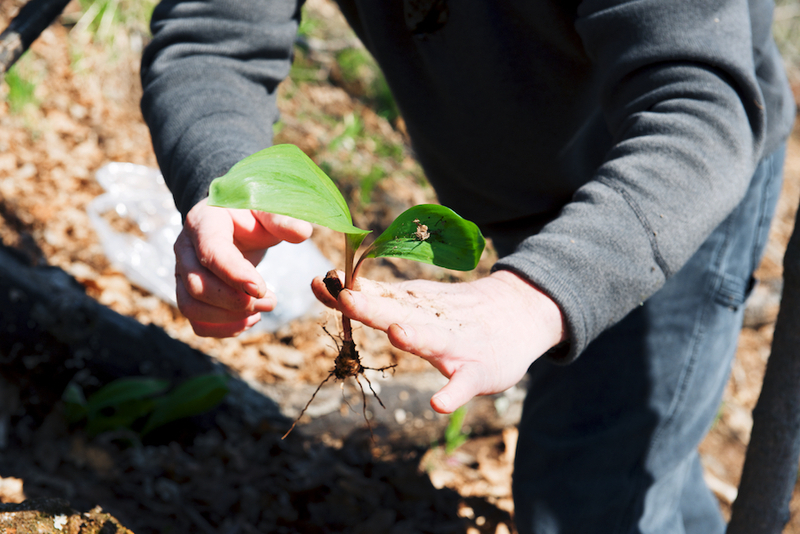 This means that, to harvest them, you must have prior knowledge of a patch where they pop up every year–and you should probably keep it a secret, so it’s not obliterated, and there will be seedlings left to repopulate the next year. This–combined with the physical labor it takes to dig them up, as I was to discover–is what allows them to fetch the prices they do. The Frenchman and I followed gentleman and lady farmer out of the lot, and along increasingly bucolic roads, until we pulled over onto the side of a steep bank that opened into a wide, brown-clear river twenty feet downhill. We collected small gardening trowels and plastic bags apiece, and set off. So vertiginous was the bank that we had to walk sideways, foot over foot. The benefit being, after just a moment, no one could see us from the road. 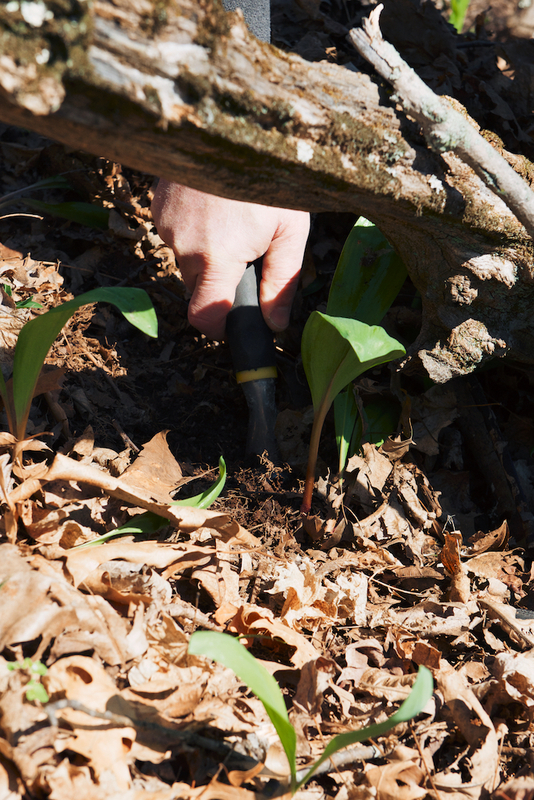 Digging for ramps is hard work! 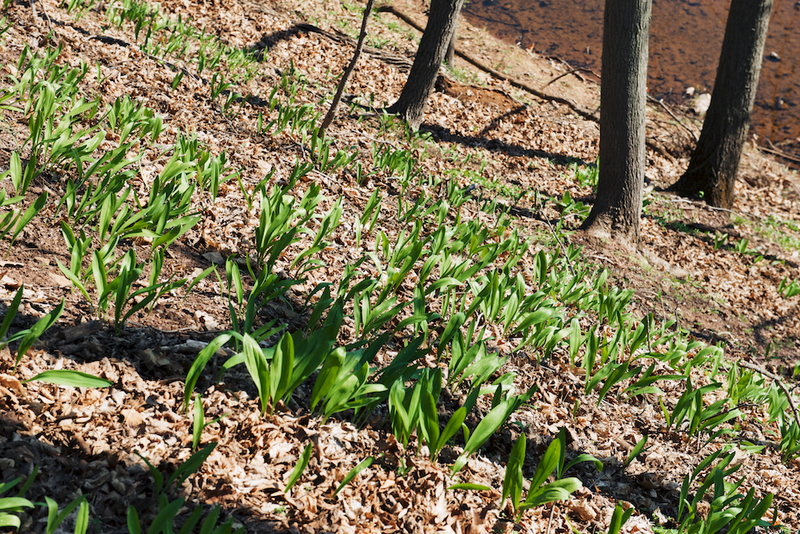 The bulbs are buried in packed earth, under a winter’s gathering of dried leaves. After trying to dislodge the roots with just my hands, I conceded that the trowels were indeed necessary. (The benefit of working with two people who know what they’re doing.) 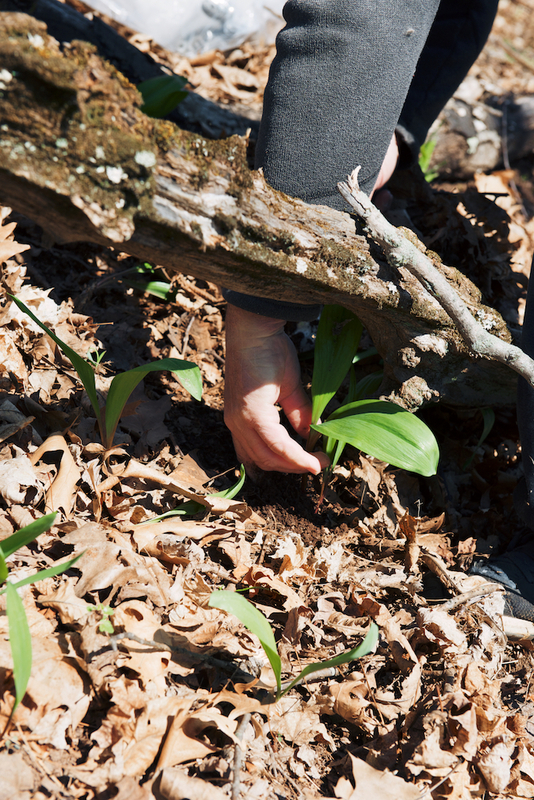 After twenty-five minutes concerted effort, the Frenchman and I had collected about two pounds of ramps between us. At home, I stood at the sink, cleaning and trimming the bulbs of what felt like (and maybe was?) two hundred ramps. There was dirt caked under my fingernails. I thought about how lucky I was–to have a husband who’d wake up early on a Saturday to mini road trip and dig around in the dirt; to have had this opportunity in the first place, through the kindness and altruism of my farmer friend and his wife, whose lovely food I get to geek out over most Saturdays. This being outside, this standing at the sink–it’s what brings me the most peace and joy. It’s my version of church. Picking through the knobby, multi-colored carrot bin, each feathered with white whiskers. The little rush upon seeing the first pack of stinging nettles, the painter’s bucket full of lilac branches. The fishmonger selling scallops in their fanning shells, the sheet pan lined with brown sugar-dusted, strawberry jam-oozed doughnuts. 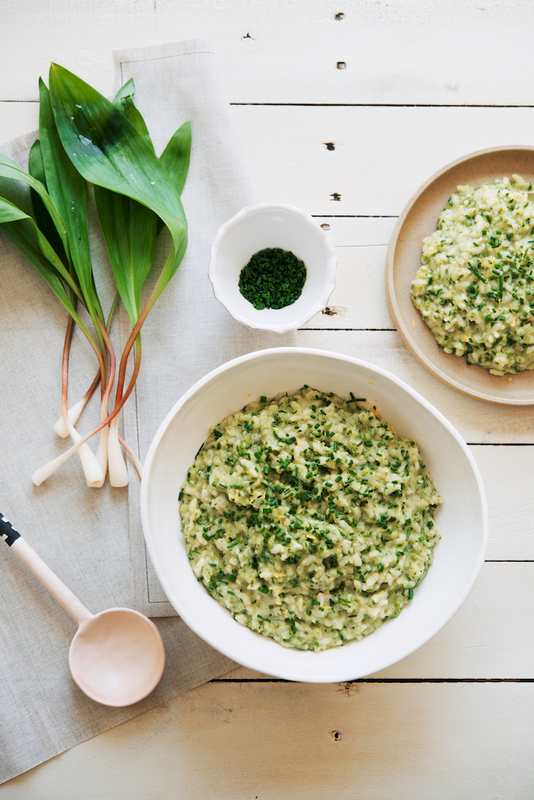 To make this dish sing even more of spring, and depending on what you have on hand, you can additionally stir in: 1/2 cup cooked fava beans, 1/2 cup gently cooked peas, raw shaved snow or sugar snap peas, 1/2 cup chopped cooked asparagus, 1/2 cup ribboned basil, 1/4 cup minced chives, 1/2 cup sauteed green garlic, 2 tablespoons to 1/4 cup fresh goat cheese, or a fried or poached egg. 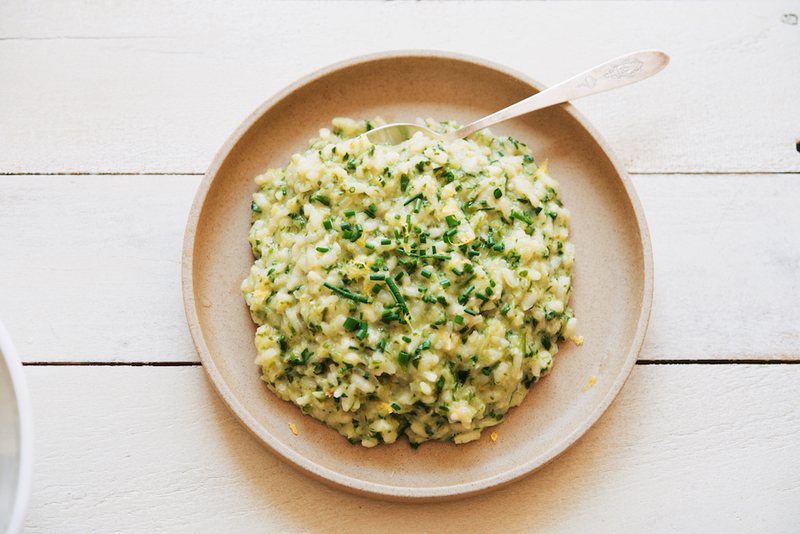 The risotto is lovely on its own, but I–a lemon fiend–serve it with lemon on the side. I’ve also topped it with simply cooked fish, or poached chicken spooned with herb butter or oil. 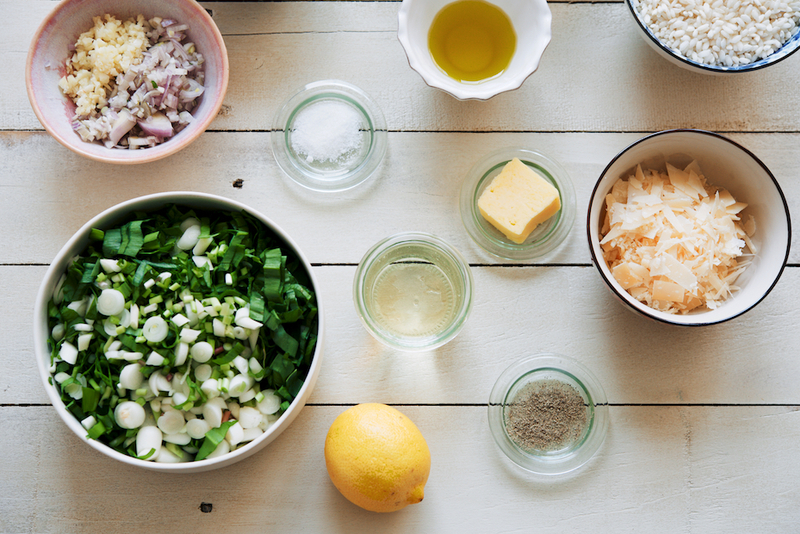 Note: The finished risotto should be runnier than what appears in these photos. 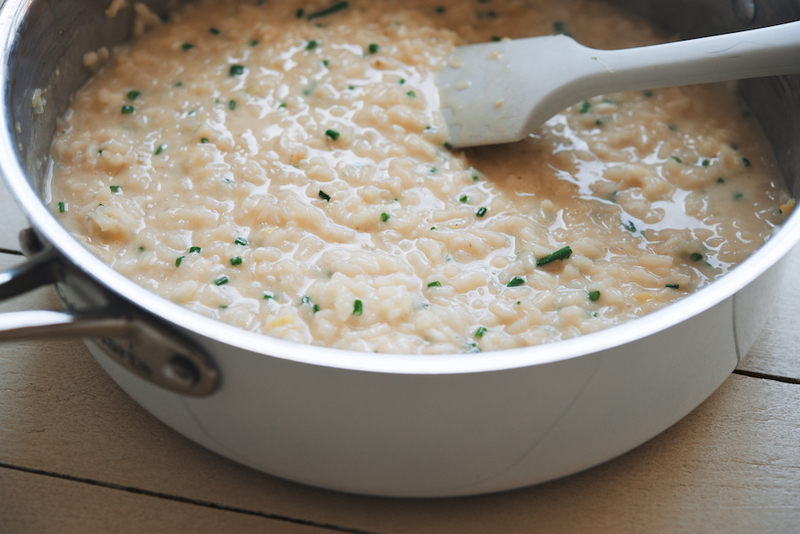 Turns out, when you stop to take photos of risotto instead of eating it right away, it dries up. 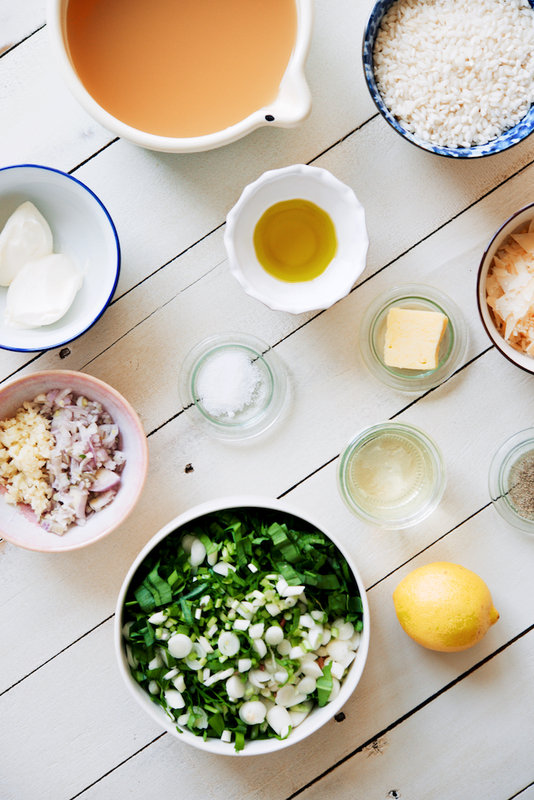 Leftovers: This recipe makes wonderful arancini. 1. Roll the cool risotto into balls a bit larger than a golf ball; move to a plate, refrigerate 20 minutes, overnight, whatever. 2. Roll the balls in flour, then whisked egg, then breadcrumbs. (For my leftovers, I needed 2 eggs.) At this stage, you can refrigerate until you’re ready to cook. 3. Traditionally, arancini are deep fried, but I didn’t want to waste the oil, so I pan fried. They turned out rather cube-like, instead of cylindrical, but who cares; they tasted great. 4. While still hot, sprinkle with kosher salt. To hold, you can keep the cooked arancini on a racked pan in a 200F/95C oven for up to 30 minutes. Serve with lemon, or flavored mayo/aioli. Leftover of leftovers: Reheat uneaten arancini in the toaster oven. 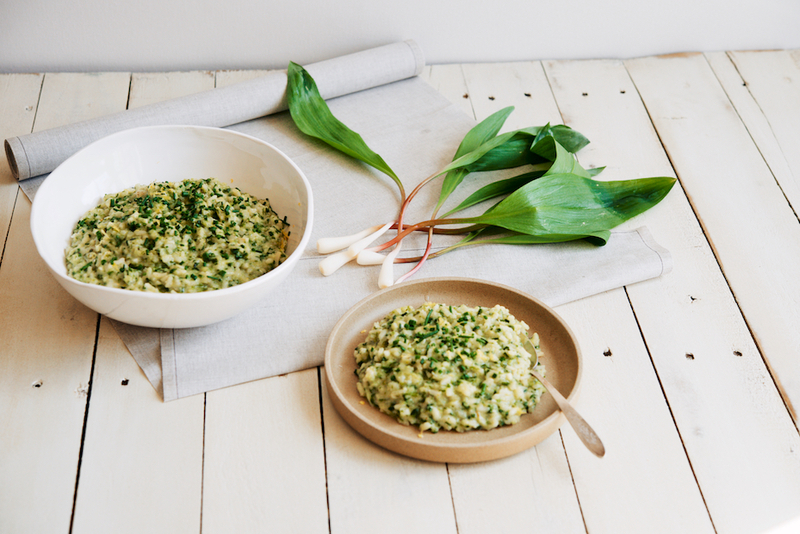 Other uses for ramps: The internet is full of ideas, but I like to make ramp butter (for fish, toast, steak, scrambled eggs), pickled ramps (ciabatta bread, good roast beef, pickled ramps, aged gouda, garlic mayo), and pesto (to put on all the things). 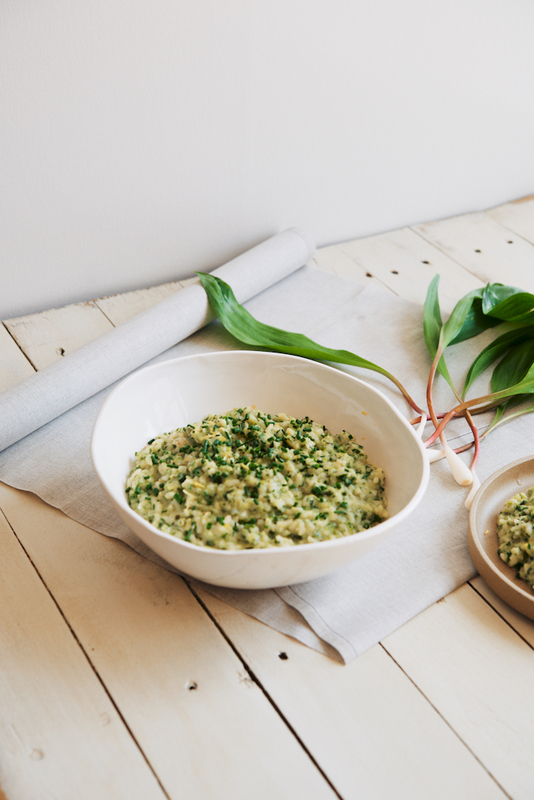 This recipe was inspired by Chef Nick Suarez’s (of Gaskins restaurant in Germantown, NY) Ramp Arancini with Ramp Aioli, which I tried at Ramp Fest in Hudson last year. This recipe can be doubled–just keep in mind that the cooking time will increase along with the ingredient quantities. Serves 2 very generously, or makes 4 starter portions. Makes about 2 quarts. 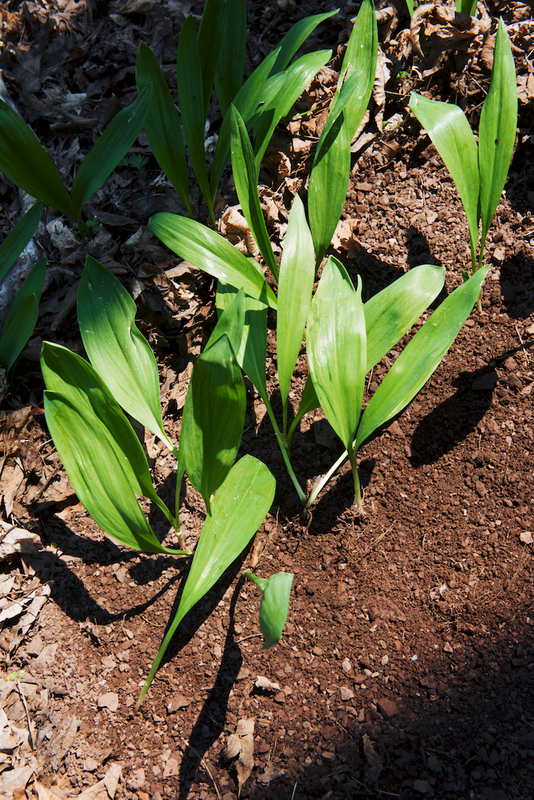 *If ramps are too difficult to find, you can alternatively use chives, or a mix of chives, garlic chives, scallions, and/or garlic scapes. 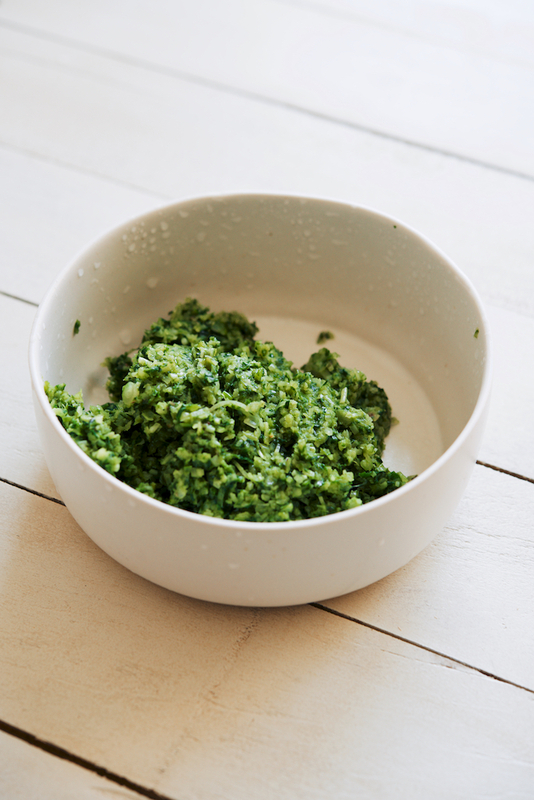 Or, blanched and drained spinach. **Use a dry, crisp, high acidity, non-sweet wine. Pinot Grigio, Pinot Gris, Pinot Blanc, not-too-oaky Chardonnay. Or, a dry sparkling wine. Pour the chicken stock into a medium-sized pot; bring it to a simmer. Roughly chop the ramps. Warm 1 1/2 tablespoons olive oil in a medium-sized pan with straight, high sides. 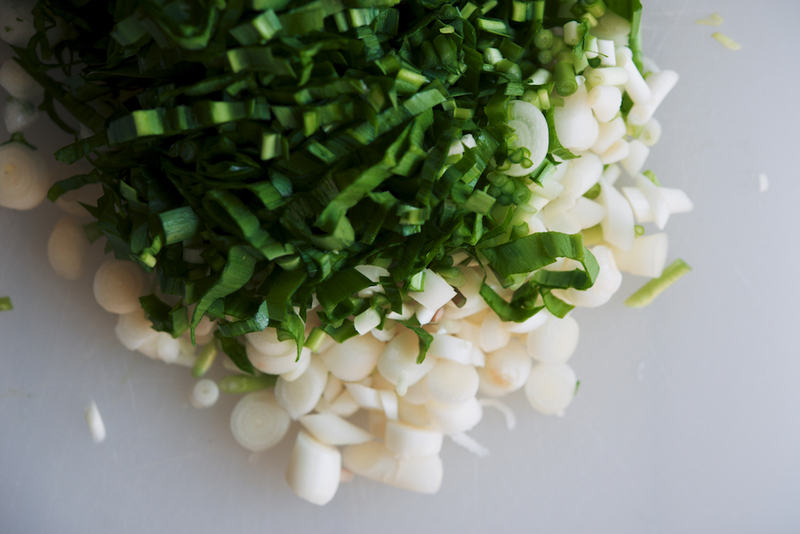 Saute the ramps for 5 minutes with the salt, until the ramps are wilty and bright green. 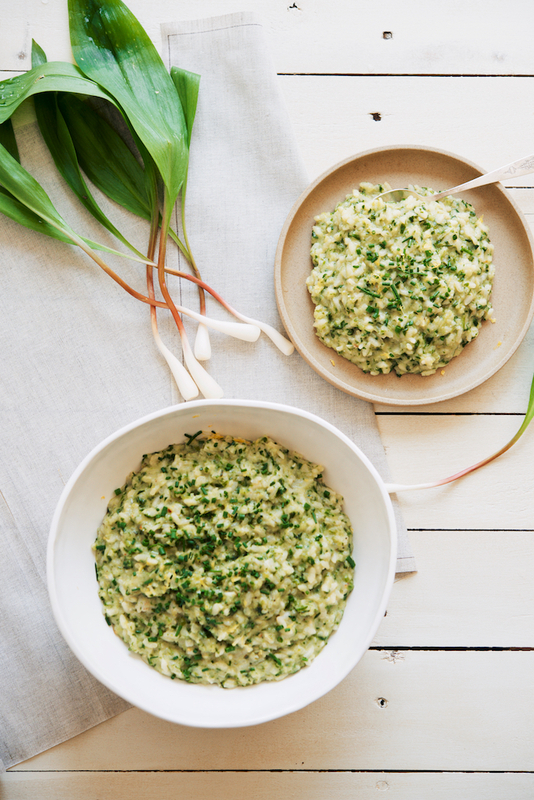 Move the ramps and lemon juice to the bowl of a food processor; blend until smooth, 30 seconds. In the same pan, warm the remaining olive oil over medium heat; add the minced garlic and shallot and saute until translucent, 3 minutes. Add the rice and stir until coated, 1 minute. Pour the wine into the pan, and reduce until the wine is nearly dissolved, 30 seconds. Begin adding the (warm) chicken stock to the pan, 1 cup at a time. Wait until the rice has absorbed the liquid before adding more. (The whole process will take about 25 to 30 minutes; I recommend a podcast.) Stir the rice intermittently, but keep your eye on the pan more or less constantly. 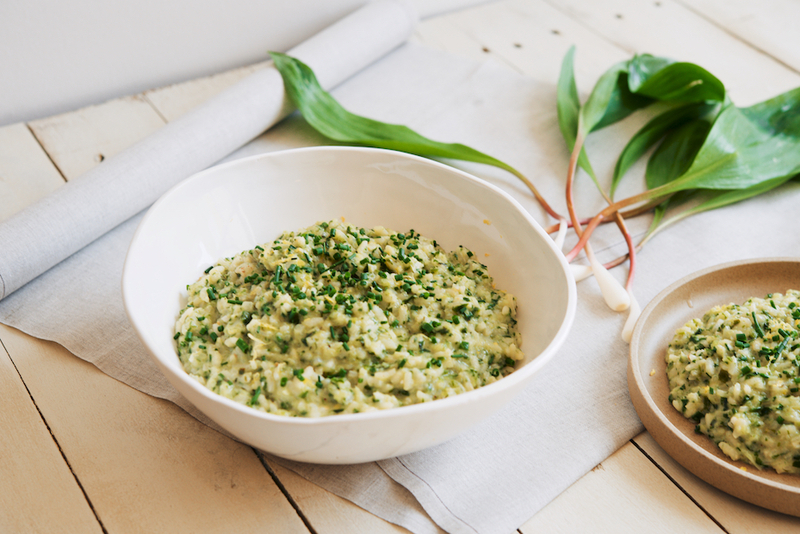 After adding the last cup of stock, and while the risotto is still a bit runny, add the crème fraîche, butter, pepper, Parmesan, lemon zest, and the reserved ramp mix. 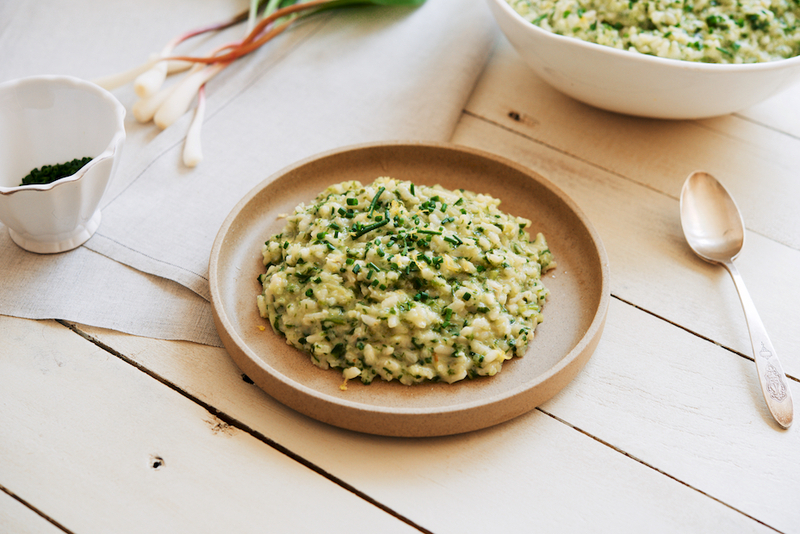 Divide the risotto between plates, and serve immediately. The presentation is so beautiful! 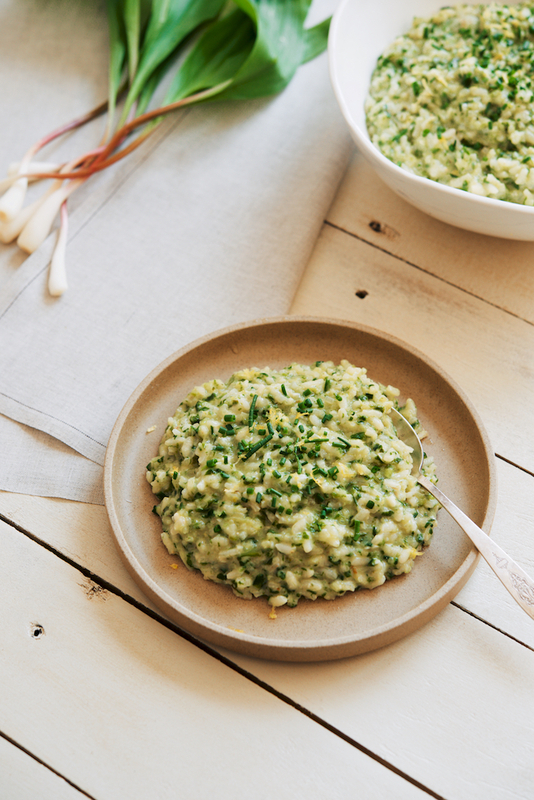 I haven’t had risotto in a while but you might have convinced me to give it a go! I hope you do! I always forget how easy it actually it, until the next time I make it. Lovely sentiments, thoughts and food! Here in Colorado we aren’t blessed with many wild ramps to forage. I have heard that they will grow in our gardens. 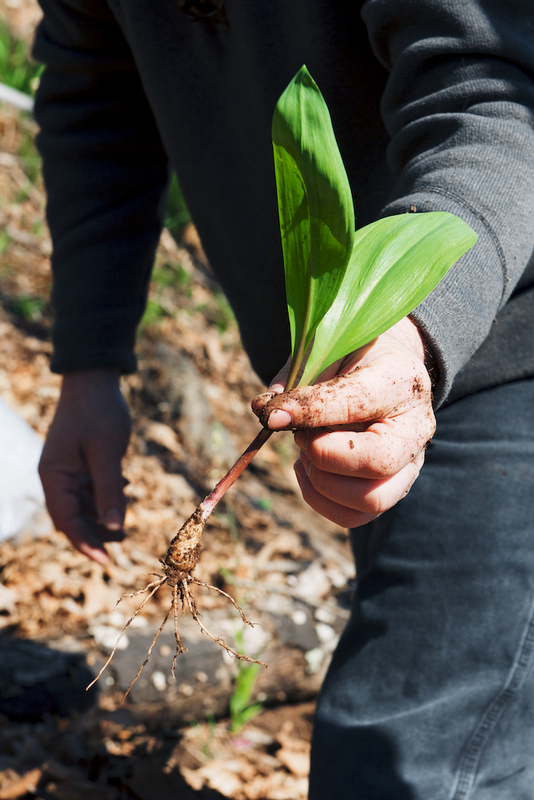 Sounds like I have a new quest… Finding ramp seeds! Looks like a fun day of foraging!